Magnetars are commonly considered as rotating neutron stars whose inferred surface dipolar magnetic fields are extremely strong. Their X-ray and γ -ray luminosities are usually orders of magnitude larger than their spin-down luminosity. It is believed that magnetar emission, particularly at high energies, is powered by the decay of the enormous magnetic fields instead of via spin-down process. In some respects, the radio emission of magnetars is different from that of normal radio pulsars. For magnetars, the radio emission is transient, the radio flux density and the pulse profile are highly variable, and the radio spectrum is relatively flat. Based on the differences in radio emission between magnetars and normal pulsars, it has been proposed that the radio emission of magnetars is powered by magnetic field decay instead of by rotation. The total number of magnetars currently known is 29. To date, only four of them have shown pulsed radio emission. PSR J1745？2900 is the newest radio-emitting magnetar. Recently, Dr. Wenming Yan, an associated research fellow at XAO pulsar research group, and his co-investigators reported on single-pulse observations of the Galactic centre magnetar PSR J1745？2900 that were made using the Parkes 64-m radio telescope with a central frequency of 3.1 GHz at five observing epochs between July and August in 2013. They found that the shape of the integrated pulse profiles was relatively stable across the five observations, indicating that the pulsar was in a stable state between MJDs 56475 and 56514. This extends the known stable state of this pulsar to 6.8 months. Short-term pulse shape variations were also detected. It is shown that this pulsar switches between two emission modes frequently and that the typical duration of each mode is about 10 minutes. No giant pulses or subpulse drifting were observed. Apparent nulls in the pulse emission were detected on MJD 56500. Although there are many differences between the radio emissions of magnetars and normal radio pulsars, they also share some properties. 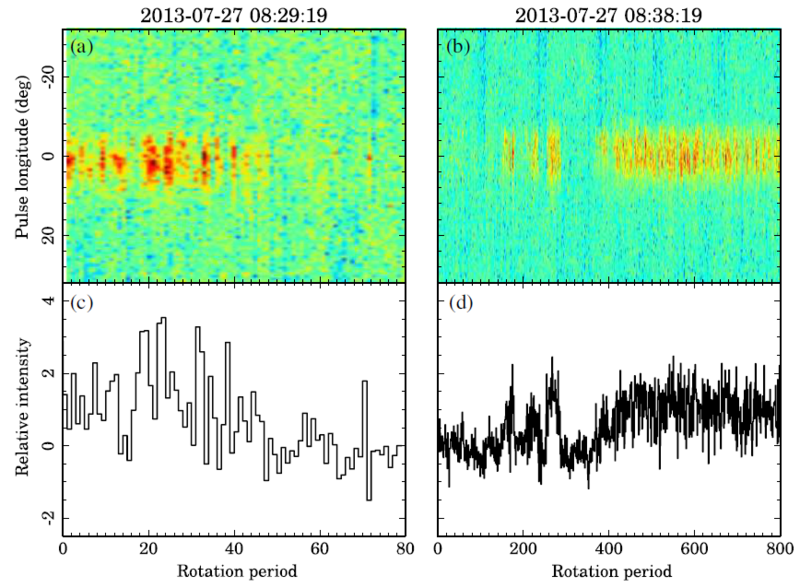 The detection of mode changing and pulse nulling in PSR J1745？2900 suggests that the basic radio emission process for magnetars and normal pulsars is the same. This work has been published by MNRAS. Pulse energy variations with time for the observation of MJD 56500 (panel d) and a 5-min prior observation (panel b) with corresponding single-pulse stacks on top (panels a and c).